Printable fancy Mardi Gras feathery face mask coloring page or mask craft template. Print out the feather mask template then cut out and attach ribbons to the sides to tie behind your head or glue one side of the mask to a narrow dowel to use as as handle. 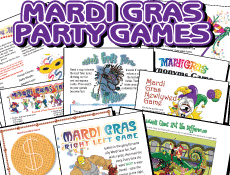 Color or paint and decorate your fancy Mardi Gras mask with markers, glitter, and feathers.